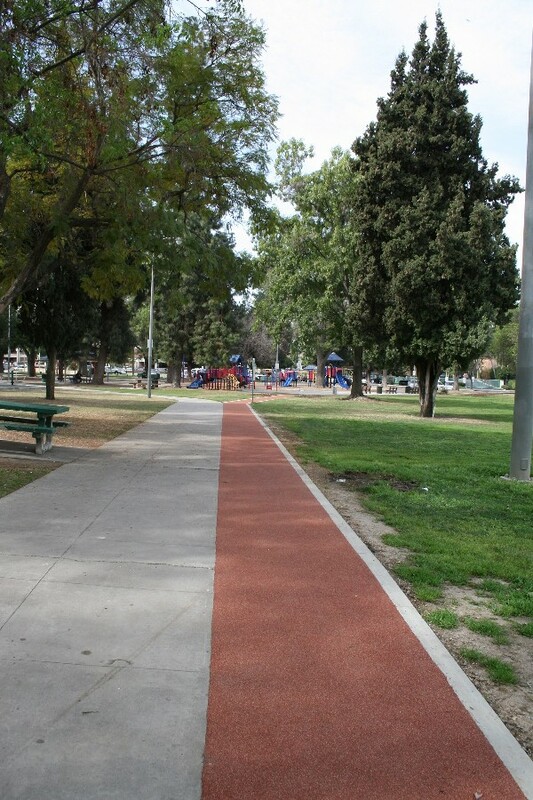 Eugene A. Obregon Park is located in East Los Angeles and offers a friendly environment for families in the community. The County of Los Angeles wanted to provide the community with a safe, resilient, ergonomic walking and jogging trail. The Rubberway sidewalk installed around the park promotes health and outdoor activity, benefiting everyone from the young to the elderly. Obregon Park is open to the public and the Rubberway sidewalk is utilized and enjoyed by many. Rubberway sidewalk is a two layer recycled rubber pavement system. It is generally specified as a porous system to improve drainage and assist with storm water management and root heave from trees but the system can be customized to varying levels of porosity.